The Philippine Ports Authority (PPA), Bureau of Customs (BOC), Association of International Shipping Lines, port operators Asian Terminals Inc. (ATI) and International Container Terminal Services, Inc. (ICTSI) collaborated and issued a Manifesto of Support last 15 March 2019 for Government’s Effort to ease the problem of overstaying containers and make Philippine ports efficient. 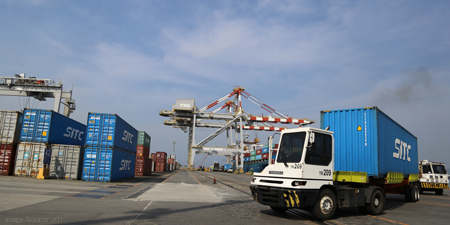 Under the manifesto, PPA issued a directive to all importers, consignees, owners, and shippers of containers already cleared by the BOC to withdraw said containers within fifteen (15) days. Failure to comply with the directive will lead to the transfer of Customs-cleared containers to designated inland container depots of ATI and ICTSI. The cost of transfer will be shouldered by the cargo owners, shippers, consignees, logistics operators, or customs brokers. For port operators, ATI and ICTSI will regularly provide government with information on the status of utilization of their ports, as well as information on containers staying inside their terminals for at least 30 days since arrival. Foreign shipping lines are required to promptly evacuate empty containers, either by regular ship calls or sweeper vessels, from the Philippines within the period prescribed by the BOC. DPWH Undersecretary Catalina Cabral presented in the recently concluded Arangkada Philippine Forum 2018 the convergence programs with other government agencies like DOT, DTI- BOI and DA that will further fuel high growth of domestic investments as well as the surge in foreign direct investments of the country. Undersecretary Cabral highlighted the masterplan of the Metro Manila Logistics Improvement Program that will enhance the road connectivity around Metro Manila. In addition to the 26 existing bridges crossing Pasig River, Marikina River, and Manggahan Floodway, 12 new bridges will be constructed to provide alternative linkages between major thoroughfares and increase the number of usable roadways that will decongest traffic in Epifanio delos Santos Avenue (EDSA) and other major roads in Metro Manila. On seaports and shipping, high cost of international and domestic shipping translates to high cost of consumer goods. Hence, Ms. Doris Magsaysay-Ho, president and chief executive officer of Magsaysay Group of Companies, recommends the creation of manufacturing and industry clusters in each region to create trade volumes, lower shipping costs, and make the country competitive. These clusters, she noted, should be developed close to port and airport infrastructures and be designed to make handling products more efficient. On air, Senator Grace Poe pointed out the P350B NAIA Consortium project that will rehabilitate, expand, operate, and maintain the Ninoy Aquino International Airport (NAIA) for 35 years. Also, she mentioned the unsolicited proposal of Bulacan Airport that is one of the two gateways being prioritized by the government to decongest NAIA’s three terminals, which have been operating over their capacity. On telecommunications, Senator Sherwin Gatchalian is hoping to fix the dysfunctional dynamics of the infrastructure development by fostering liberalization and competition through reform legislation. These measures include amendments to the 80-year-old Public Services Act to clarify the definition of public utilities as only those public services which are natural monopolies by nature. This is being sought by Senate Bill No. 1754. He also clarified that easing the country’s foreign investment restrictions is not meant to favor foreign firms over domestic players.